Some of the UFC's brightest prospects head to the spotlight when the Octagon ventures into Sakastoon, Canada main-evented by two Featherweights looking to break through the ceiling as Max Holloway clashes with Charles Oliveira. TheSportMatrix's resident MMA Genius breaks it all down. 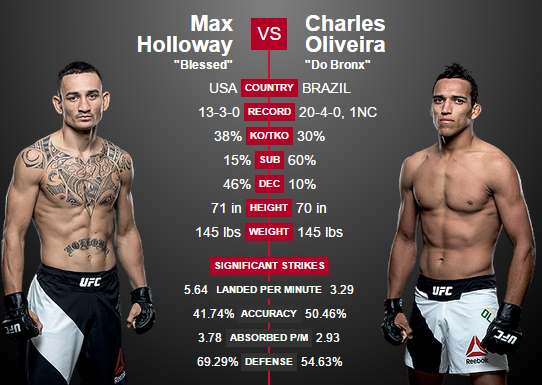 It's no secret that Holloway is the better and more dynamic striker, but Charles Oliveira actually has been more accurate and has gotten hit less than Max in their respective UFC careers. Max has a diverse attack from both the orthodox and southpaw stance. He uses his spinning back kick and flashy kicks to keep guys at bay and implement his distance striking. Max's hands have also been on display, he picked apart an elite striker in Cub Swanson with ease, and finished another great striker in Justin Lawrence with a timely body shot. In his recent winning streak Max has been piecing up his opposition with ease, but he hasn't faced anyone on that streak with the ability to put him on his back. Charles has very good muay thai fundamentals, fights tall, has strong leg kicks and knees, and the occasional flying knee. Charles lacks in the punching power department compared to Max. The only person that he's dropped and hurt with punches is Nik Lentz. Another thing is Charles doesn't move his head that well off the center line. With a diverse attack like Max has that could spell trouble. Max has started slow at times like in the Chope, Garcia, and Lawrence fight, but he stays composed and then turns the heat up. All in all, advantage to Max. Not too many can compare to Charles Oliveira on the mat. We are talking about a guy that finished a fight with a calf slicer, submitted Hatsu Hioki, Darren Elkins, and Nik Lentz arguably twice. Despite the kneebar loss to Jim Miller and dec. loss to Frank Edgar, Oliveira controls the overwhelmingly majority of the action on the mat. Lately he has increased his Fight IQ by throwing himself into grappling situations and draining his opponents by defending the constant submission and sweep attempts. This was very evident in the Stephens, Lentz, and Hioki fights. Max has come a long way since his submission loss to Poirier. He submitted Andre Fili and Cub Swanson with beautiful guillotine chokes. Max's weakness is definitely wrestling, and he hasn't faced a legit takedown threat on his winning streak. Charles has underrated takedowns as well and he is very good at catching kicks, which plays into the fight a lot. In close he will attempt a judo throw in attempt to win a scramble. In my opinion, Charles is definitely better off his back than on top, so I expect him to attempt to pull guard alot if he gets in close range. Max has to be really careful with his distance vs Charles because all it takes is one mistake and you could be tapping. Holloway: Stay on the outside, in and out movement, multiple punches at a time. Oliveira: Get the fight in grappling situations at all cost. I actually see Charles coming out and winning the first round by holding Max in am armbar or triangle, but the diversity of Max's striking will be too much for Charles as the fight plays on. Max finishes him with strikes in a great fight. It's no secret that Erick Silva that is an explosive and dynamic striker. He has fast hands and hard kicks, but throughout his career he only has this for a round at the most. His striking defense is what gets him into trouble. He absorbs a lot of punishment whenever he faces top 15 opponents. We have seen when you press Silva with constant pressure he is super hittable. In the Kim fight, Kim charged and charged at him and absolutely drained Silva by the 2nd round and eventually KO'd him. We saw in the Brown fight, Silva came out strong but faded after the 1st like he typically does in his losses. Magny is a very long fighter that throws a ton of jabs and then mixes in that straight right hand. Magny doesn't really like getting hit but his opponents haven't really capitalized due to his great composure. Magny does have a way higher output than Silva, especially throughout the duration of the fight, mainly due to Silva's cardio issues. The problem is I don't think Magny really has the power to hurt Silva, he kind of just has that Bisping style with the in and out movement and pitty patty punches. 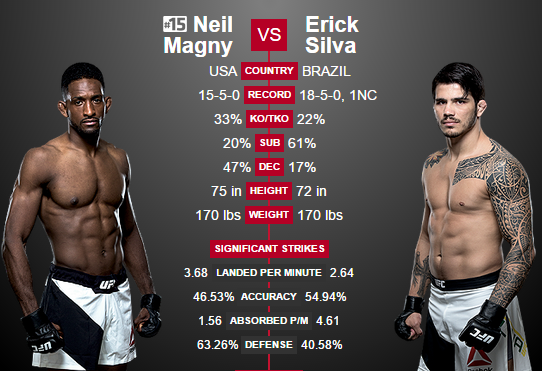 If Magny survives the first round he does have the chance to outpoint Silva for a decision win. All in all, Silva has the edge striking with speed and power, but it could get interesting if Magny can weather the storm as Silva has had problems with pressure. Erick Silva has excellent bjj at times and shows flashes of excellence. Not taking anything away from his skills, but those wins were against fighters that couldn't keep their spot on the roster. In fact, Out of Silva's 6 UFC wins 5 of them are not in the UFC anymore, and the remaining one barely is. In the Fitch and Kim fights in particular, there were times that Silva would hit the mat and just not respond and accepted getting pounded on, due to him just being exhausted. Magny has had his problems on the mat against Maia and Moreaes, but those guys are worldclass bjj players and Silva isn't on that level. Silva still can explode into submissions, but it's the same case with his striking, he generally only has that explosiveness for a round tops. Magny can take of some advantage of some positions if he makes it to the later rounds depending on the state of Silva's cardio, but Silva has the better grappling skills plain and simple. I think Silva's early onslaught will be too much for Magny, I think he hurts him on the feet and then finishes him with a submission. When Cote first entered the UFC he was a serious power threat with his right hand but times have changed and that power seems to have gone away and has become more of a guy that edges decisions out. Cote throws an overload of right hands, and if you watch his fights you will see he rarely lands or even throws left hands. He has added a bit of kicks in his arsenal, but none that should put any type of fear in his opponent. He definitely is better at close distances than at long range. Cote is also not a counter striker. He generally comes forward in all of his fights. On the other hand, Burkman is similar in a way where he throws a lot of right hooks but the difference is the power. Burkman has a piston of a right hook and what makes it deceptive is he is constantly switching stances. He dropped Jon Fitch with hit before subbing him and Aaron Simpson with hit before timing a knee to finish him off. He also tagged Lombard several times with the right hook in the 1st round, and hurt Kim twice with the right hook. He also likes to throw Jon Jones' style front kicks to the knees and attempt a lot of awkward techniques. Now he does have enough power to hurt Cote, but not finish him as Cote has an iron jaw and has never been stopped with strikes. Burkman has not been stopped with strikes either, and he is faster, more powerful, athletic, and has more of a diverse arsenal than Cote. Burkman likes to sit back as well and let his opponents come to him, and Cote will surely come forward. Advantage to Burkman. Burkman is known for putting Jon Fitch to sleep with a guillotine, but he is kind of inconsistent on the mat. At times he does good things and at other times he makes errors. He has decent takedown defense. Most of his losses are by submission, but Cote is not a submission threat. Burkman took down accomplished D1 wrestler Gerald Harris in a WSOF fight when the fight was on the line. In the WSOF title fight vs Steve Carl, he gave positions up after taking Carl down and he reversed Carl from bottom showing me had the skills but then he got caught in a triangle. When Lombard took him down, he worked his way back up as well, but all in all he is inconsistent. Cote on the other hand has added the threat of a takedown in his recent fights, but he still has a big weakness of his back. For example, In the Bobby Voelker fight, he got taken down in the 1st and 3rd round and could simply not work his way back up. In fact most think Voelker won this fight, and I thought Bobby clearly won. Another example in the Tom Lawlor fight, Cote was taken down at will and could not get up, and in the Cung Le fight he was taken down in the last round. Patrick can get takedowns against the fence but I don't think he'll be able to do it consistently vs Burkman. All in all, I think Burkman can take Cote down more consistently. Cote can take him down too, but Burkman will work back up. Advantage to Burkman slightly. Cote: Stay composed, look for takedowns against the fence. Burkman: Throw the right hook, counter strike. look for takedowns. So Patrick Cote is technically won his last 7 fights in Canada if we disregard the Sakara and Voelker fights. I think Josh can land the more effective strikes on the feet and hurt Cote with that right hook and keep Cote at bay with some knee kicks and stay on the outside and outpoint him. Cote is very predictable as he mainly only throws right hands. Cote's best bet is to try to look for takedowns and edge a decision out but I think if Burkman wants to take Cote down he can whenever and I can't say the same for Cote unless Josh comes in out of shape which is possible. 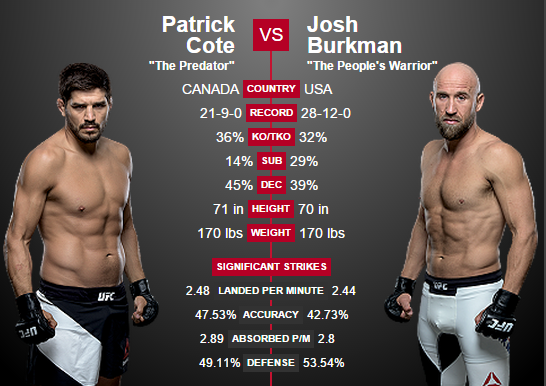 All in all, I truly believe Burkman is the better fighter and if he comes ready for this fight he can win a decision in Patrick's home country. Trinaldo does have decent striking. He has a low southpaw stance and loads up on his strikes, especially his overhand left and left uppercut. Trinaldo throws heavy shots early but as the fight tends to extend the effectiveness of those shots die down especially if he gets taken down. We have seen Laprise get taken down in his fight vs Mercier and Barberena, but he has shown good technique and worked his way back to his feet everytime. He also took down and took Cedeno's back consistently, but that really isn't too impressive. Trinaldo is a brown belt under Sergio Moraes asnd when he gets on top he can definitely be smothering at times. He does have submission wins over Keith and Rio but no offense those guys are not on Chad's level. Laprise has a very good sense of urgency to get back up right away. Trinaldo has had some trouble off his back like in the Chiesa, Hallman fights. 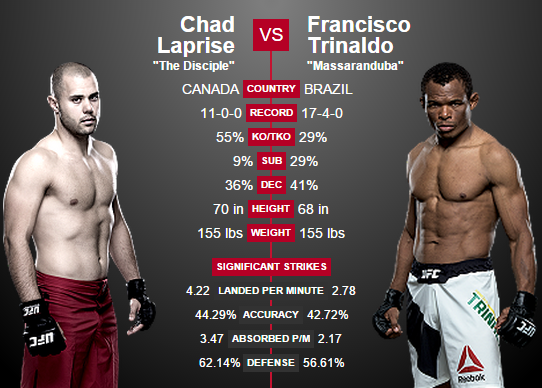 If this fight hits the 2nd round and Trinaldo gets taken down, Laprise can definitely control him. All in all, Trinaldo might have a slight edge for a round but after that I think if Laprise wants to outgrapple him he can. I think Laprise will be able to pick him apart standing and keep Trinaldo frustrated with his lateral movements. Once Trinaldo slows down he may even look for a takedown. Laprise should just be one step ahead. Mercier has shown in his early career that he is a submission specialist, especially with his rear naked choke and he has even pulled off a key-lock in the octagon. Mercier has an excellent left kick whether it be to the body or head. He does keep his right hand down a bit which could play a factor in this fight with Sims. Tony Sims has excellent hands and hand speed. He is deceptive because he constantly switches his stance. He probably switches his stance more than any other fighter along with Demetrius Johnson. Most of his wins are by KO and early, but those were against non-UFC opponents. He starched Steve Montgomery at 170 with a beautiful left hand in his debut after getting rocked himself. I think he is better from the southpaw stance but he likes to switch and switch. He doesn't throw to may kicks because he really hasn't had to fighting in small promotions. The only time he's been really pushed was in a fight vs Drew Dober which was very close. He did slow down after having Dober rocked several times in the first, but that was definitely a learning experience. Mercier will definitely be the best grappler he has faced by far. All in all, this fight is very close. I give Sims a slight striking advantage, especially with his movement and hands. Mercier can definitely hang in there in the striking department, but where he wins this fight is clearly the grappling. Sims hasn't faced anyone near the grappling skills as Mercier. When Mercier gets a hold of you, he is looking to take that back and sink something in. Moroz hit primetime in her debut vs a hyped Joanne Calderwood in Poland. All but one of her victories are by her favorite technique the armbar. Along with these submission skills, Moroz has also has some very crisp hands. She is a former member of the Ukranian national boxing team. What Maryna wants to do is get Valerie against the fence and jump guard in attempt to get a hold of that arm and no one has been able to stop her yet. Valerie, on the other hand, is a very well rounded fighter and very underrated in my opinion. Valerie does get pushed into the fence quite a bit and that is exactly where Moroz wants her. Val has a very nice uppercut and left high kick. She also has decent ground skills, and has only lost to the best in her professional career. She did get submitted by Roxanne Modaferi to get into the TUF house but she has made significant improvements training at American Top Team. She recently did make a 20 pound drop in weight and looked terrible physically at her last weigh ins but it really didn't affect her performance, but from hearing things in the past the 2nd cut might even be worse when dropping that much weight. All in all, I give Moroz a slight advantage in the striking, definitely the advantage on the mat, and a speed advantage. So we're all set for Saskatoon! Which prospects will emerge victorious on a Sunday night Octagon showcase? Some of the UFC's brightest prospects head to the spotlight when the Octagon ventures into Sakastoon, Canada main-evented by two Featherweights looking to break through the ceiling as Max Holloway clashes with Charles Oliveira. TheSportMatrix's resident MMA Genius breaks it all down.